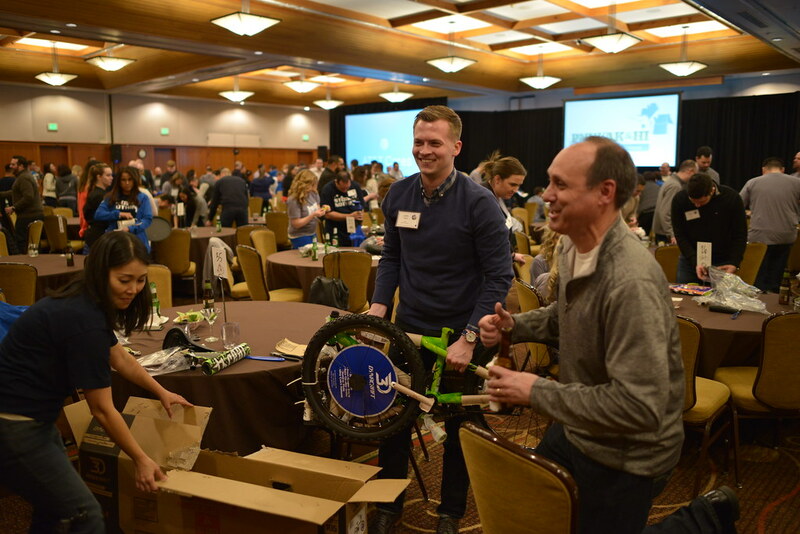 On Tuesday, the Community Cycling Center, with the help of six amazing volunteers, headed out to Skamania Lodge in Stevenson, WA to assemble bikes with the AT&T Cares Program. As we set up, Mariel of AT&T Mobility told us a little secret. 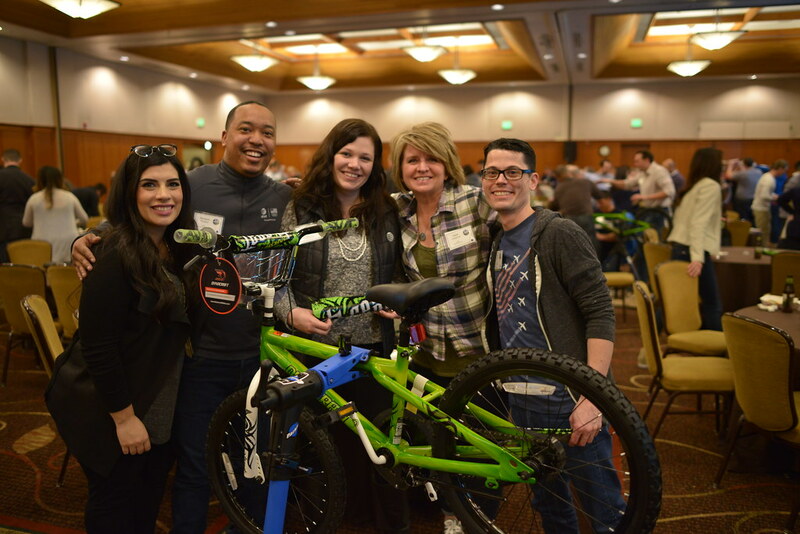 Her team of almost 200 Pacific Northwest, Alaska and Hawaii Market senior leaders and store managers had no idea what activity we planned for the day. She asked us to hide all of the bikes, tools, and even ourselves behind the stage for the big reveal. Excitement grew as the room filled. AT&T Pacific Northwest Vice President and General Manager, Mike Maxwell, introduced our CEO, Mychal Tetteh, and the partnership with the Community Cycling Center. Curiosity increased as Mychal shared our mission, told our story, and that of our community partners. 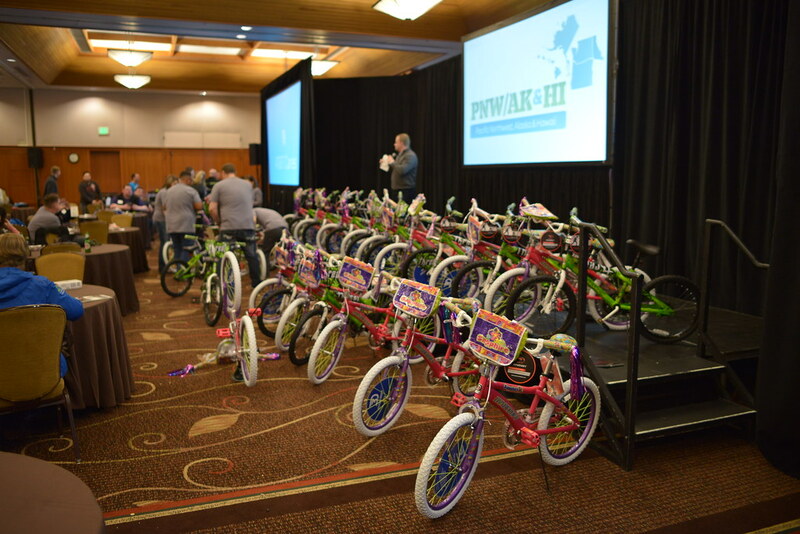 Cheers erupted as Mike announced the activity: almost 200 people assembling 41 brand new bikes at the same time. They were off! The room filled with flying cardboard, turning wrenches, and excited chatter as teams of five assembled all of the bikes. In less than an hour, we had 41 bikes for the Holiday Bike Drive! In addition to helping us build bikes, the AT&T Cares Program donated $10,000 to support our programs and help us get closer to the 1,000 bike challenge. Thank you AT&T! Thank you Cyclone Bicycle Supply for helping us purchase the repair stands necessary for this bike build and more in the future. Does your business want to help us reach the 1,000 bike challenge? Contact Patrick@CommunityCyclingCenter.org to find out how you can help!